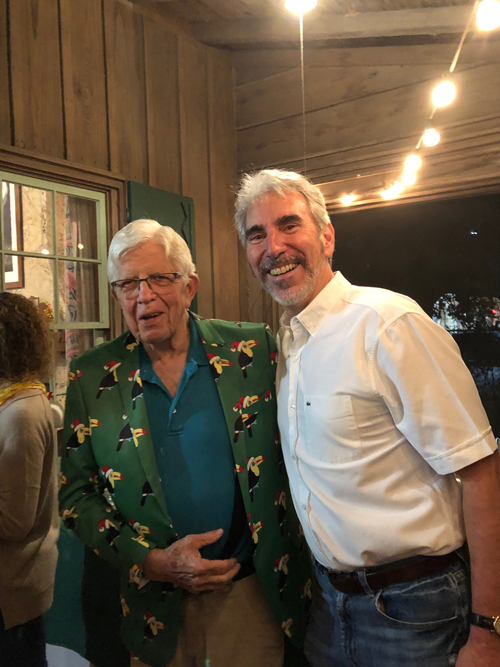 As a history buff, High Pines resident and retired educator, I jumped at the chance to research Tropical Audubon Society (TAS) and the house it has owned since 1976 when recruited by its board. 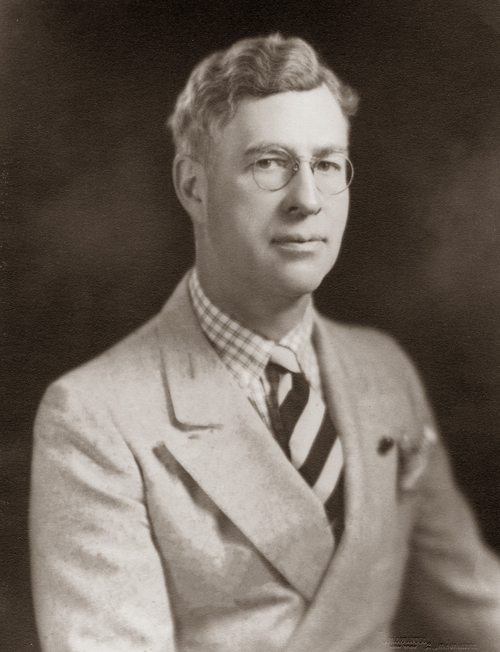 After digging in with TAS more than 5 years ago, I have unearthed many fascinating facts about the society, its benefactor, Arden Hayes “Doc” Thomas (1887-1975), and about the distinctive home he gifted the organization. A chapter of National Audubon Society and a nonprofit 501c3, TAS’s local roots date back more than 100 years. Its mission of protecting wildlife, habitat, water resources and quality of life shapes its current conservation work: helping propel Everglades restoration and protection of Biscayne Bay, Florida Bay and the Biscayne Aquifer no less! 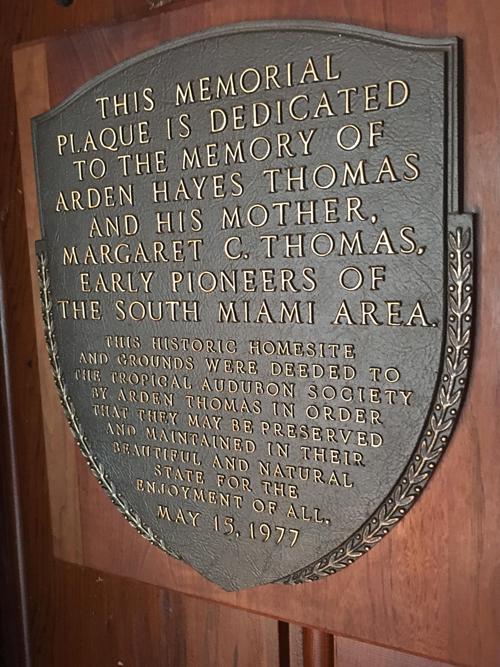 Yet it was Doc Thomas’s gift of the house and grounds that has added a unique dimension to the society’s South Florida role. 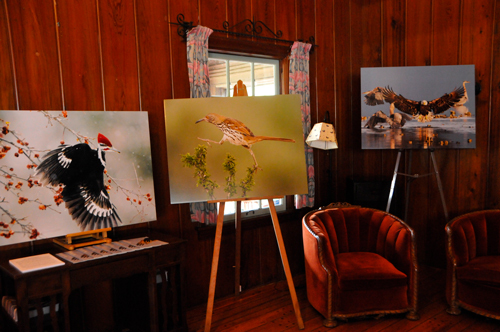 So, in addition to its ornithological and conservation concerns, TAS also became a historic preservation organization upon receipt of the Doc Thomas House. There is nothing like an actual visit to truly appreciate the house’s character and history, so I intend to pique your curiosity in the story that follows, and welcome you in person for a guided tour at 1 p. m. or 3 p. m on the first Saturday of any month through June. Remember the O. K. Feed Store? 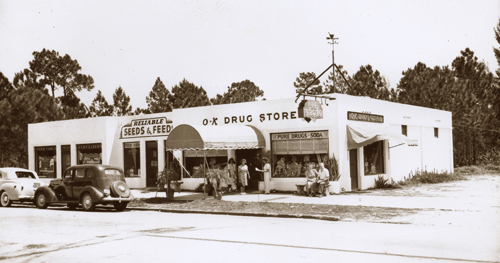 Roundabout 1935, Doc Thomas moved his drug and feed stores from Sunset Drive up to South Dixie Highway into a larger space. He closed the pharmacy in the mid-1950s and expanded the O. K. Feed Store, where it operated until 2000. Its good name was subsequently sold and O. K. Feed Store now operates in Homestead. Its website states: “OK Feed has been a family owned business for over 90 years! We were established in 1926.” Doc left the feed store to his employees, in particular J. Frank Tipton, Sr., whose descendants still own the South Dixie Highway building now occupied by Papa John’s Pizza and Crown Wine & Spirits. The O.K. 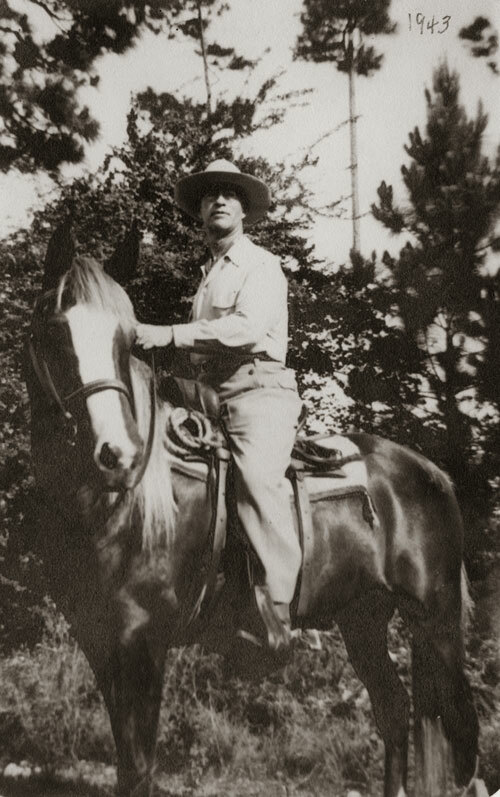 Feed Store founder, pictured here in 1943, was often seen astride a horse; a stable once stood where the TAS chickee is sited now. 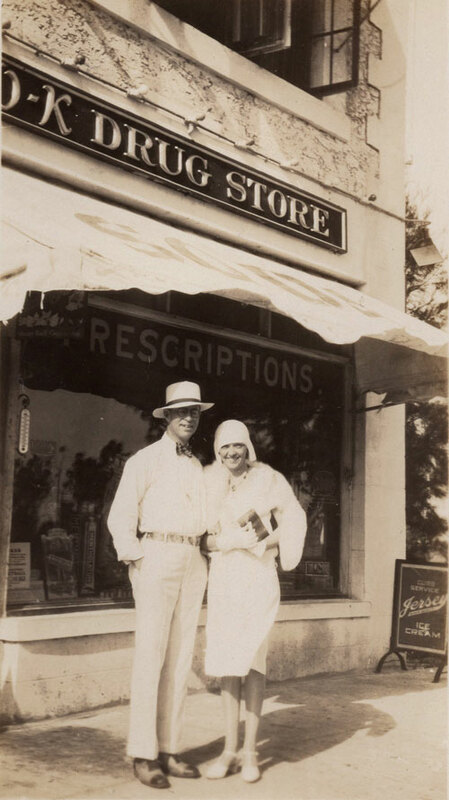 Dapper Arden Hayes “Doc” Thomas, pictured here on Sunset Drive in the late 1920s with an unidentified friend. Thomas and Loretta Jarro maintained decades-long relationship, and she was named in his will. Perched just east of the bustling South Miami business district and dwarfed by newly built McMansions and office buildings, the unassumingly rustic Doc Thomas House presides over 2. 2 acres of green space comprised of pine rockland and tropical hardwood hammock. Any visitor — be it a migrating warbler seeking sustenance or a curious passerby craving tranquility — will discover a natural oasis in stark contrast to the concrete that hems it. Now step inside the 1,775-square-foot, 3-bedroom, 2-bath cottage and embark on a trip back to the early 1930s. Visitors then and now enter from the classic front porch and are taken into the embrace of (and wowed by) the vaulted tidewater red cypress-paneled living room. Pegged oak, walnut and mahogany floors, and a towering limestone fireplace anchor the expansive room. Built-in features include a window seat with hideaway storage. A dining alcove is tucked between the fireplace and the kitchen. 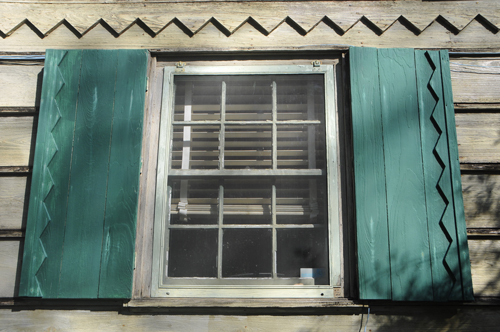 Ornamental saw-tooth and scalloped woodwork designs indicative of the period are repeated indoors and out. Indeed, the quaint abode was designed in harmony with the woodsy Larkins area (now South Miami) with which Thomas fell in love after moving to Miami from Fortville, Indiana in 1925. He opened O. K. Drugs in 1926 on the north side of Sunset Drive (Coral Gables), soon followed by O. K. Feed Store in an adjacent space. Thomas and his widowed mother Margaret lived above the stores for nearly 6 years (the ground level is now occupied by Freshealthy and Sake Room). While he was growing his businesses, he also purchased 16 lots across the street in the then-new, unincorporated High Pines subdivision. In 1931, eager for larger quarters, Thomas commissioned Robert Fitch Smith, newly graduated from the University of Miami architecture program, to design a home that would fit organically into the property’s wooded setting. 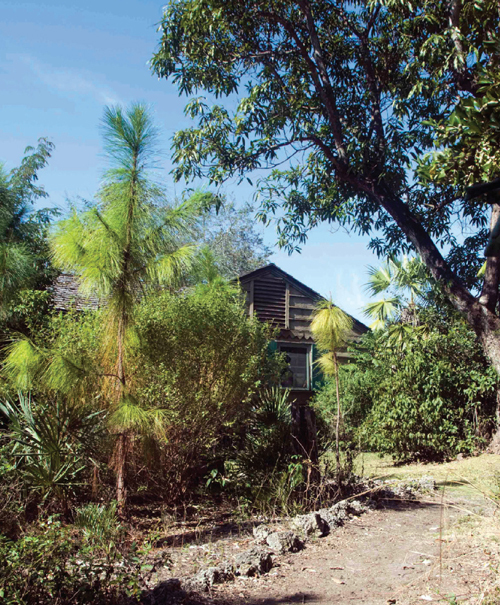 The modest house Smith conceived was constructed primarily of native woods, local oolitic limestone and coral rock quarried from the Upper Keys. The result was a more polished version of a Florida wood-frame vernacular cottage influenced by the Arts & Crafts movement (1880-1920). One of the most unusual features is the horizontal board-and-batten cypress siding rabbeted together in a pleasing design to form both the exterior and interior walls. True to Thomas’s vision, Smith’s cottage departed radically from the Mediterranean Revival and Art Deco styles then in vogue in Coral Gables and Miami Beach. 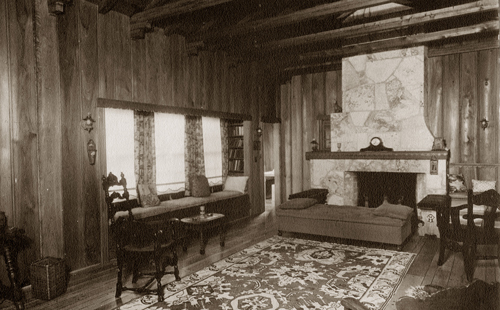 Built-in benches and tidewater red cypress paneling distinguish the vaulted living room, pictured here in the mid-1930s with its original decor. The clock still roosts on the mantel today. Arts & Crafts Period-inspired sawtooth architectural details ornament the house indoors and out. 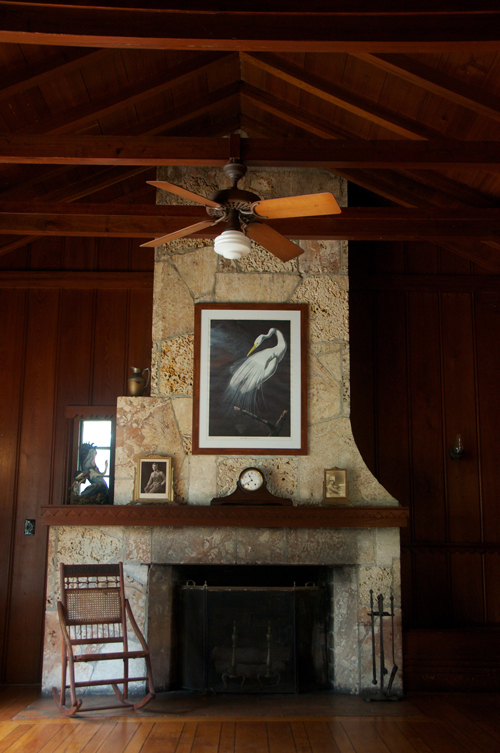 The iconic John James Audubon “Great Egret” illustration crowns the masterfully designed native stone fireplace. After his mother’s death in 1940, Thomas lived alone in the house until his own death in 1975. 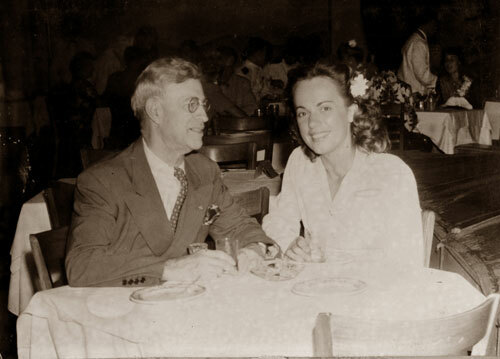 He never married or had children but was deeply rooted in the business community, was engaged in society and was frequently out on the town with lady-friend Loretta Jarro (32 years his junior). By the mid-1950s, Thomas had begun his world travels, which are charted on a Pan American Airways map that still hangs in the cozy dining alcove. 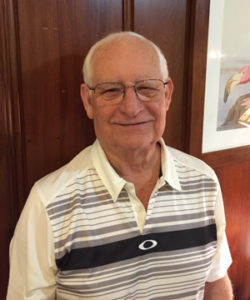 As his businesses grew, he eventually moved them to South Dixie Highway where the O. K. Feed Store flourished for decades in the space now occupied by Crown Wine & Spirits. Thomas retired from pharmacy operations at age 68, and spent more time gardening, socializing and traveling. Longtime locals fondly remember the dapper Thomas. Though he possessed no medical degree, residents looked to him as the town’s well-respected quasi “doctor. ” Many were also fond of his horse “Goldie,” whom children spoiled with apples and carrots. TAS Board member and Events Chair Elizabeth Smith was among those kids proffering carrots through the fence. Today she helps orchestrate a rich calendar of community events staged variously in the house, under the chickee, in the picnic grove, on the Keystone patio, the porch or the front yard. Because Thomas was an Audubon Society life member and had no direct heirs, he chose to deed his house and most of the property to TAS in a life estate — a gift that assured the wooded parcel would not be developed, the house would stand and the community would benefit. After Thomas’s death on December 31, 1975, TAS received the house and 14 of the original 16 lots. The two remaining lots were deeded to Jarro, with whom he had maintained a decades-long relationship. TAS took formal possession of the property in April 1976. Ever since, the Doc Thomas House has functioned as TAS headquarters and as a meeting space for other environmental groups, while the grounds (named “Steinberg Nature Center” in 2012 for TAS board member and benefactor Alan Steinberg) serve as educational and recreational open space for scouts and area residents, thereby fulfilling Thomas’s last wishes. TAS President Jose Barros (R) and longtime Board Member & Chair “Brother” Milledge. John James Audubon (1785-1851) was the 19th century ornithologist, naturalist and wildlife artist who awakened public awareness of birds by depicting them in their natural settings. His most significant work is Birds of America, originally a folio of 435 life-sized prints. Audubon lived an illustrious life and eventually settled with his family on the Hudson River in Upper Manhattan where he died in 1851. Decades later, his name was borrowed by bird enthusiasts wishing to organize primarily against the large-scale slaughter of plume birds for their feathers. The first lasting Audubon society dates to 1896 with the formation of Massachusetts Audubon Society. By the early 20th century, Audubon societies had been founded in most states, including Florida, and were actively lobbying state legislatures to protect certain bird and other wildlife species. In 1902, state societies banded together as the National Association of Audubon Societies for the Protection of Wild Birds and Animals (shortened to National Audubon Society in 1940). Today, nearly 500 chapters roost in the national “nest,” 45 of which are based in Florida. 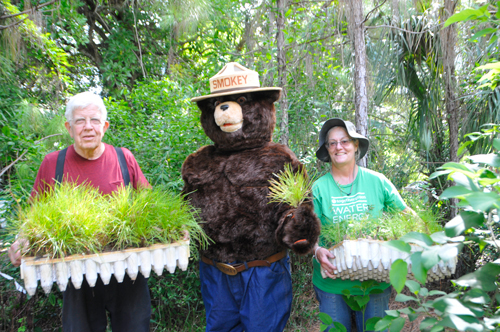 Restoring pine rockland begins with clearing invasives and planting seedlings. Grounds Chair Lewis “Brother” Milledge and MDC Environmental Resource Project Supervisor Joy Klein get an assist from Smokey himself. Now pushing 90 years old, the Doc Thomas House has become an authentic relic of Old Florida and a recognized architectural gem, both locally and nationally. It was first designated an historic site by Dade County on its 50th birthday in 1982; it was listed in the National Register of Historic Places in 2014 and earned Florida Heritage Site status in 2016. Monthly Eco-Restoration Days and guided house tours, seasonal Bird Walks, weekly yoga classes, winter Conservation Concerts, February Bird Day, March BEE-cause Flea, Spring and Fall “Walk in the Woods with Wine & Whisk” dinner parties, April Birdstock and Members Migration, art exhibits, May Movie Night, June’s native plant sale, open houses, happy hours, field trips and corporate workdays are among the on-site events hosted here by TAS staffers (Education Director Alison Enchelmaier, Events Director Amy Creekmur and Communications Director Ana Lima) with the help of a working board. Of special note, Barros and fellow board member and Field Trip Coordinator Brian Rapoza lead frequent free bird walks regionally, while Rapoza also orchestrates exotic birding adventures abroad. The Steinberg Nature Center grounds are always a magical place to bird. In addition to tropical hardwoods and pines, it is graced with a handful of legacy trees planted by Thomas decades ago. Among those still standing sentinel are a massive Kapok tree, a Royal Poinciana and a bountiful mango. This urban oasis is stewarded by longtime TAS Board Member Lewis “Brother” Milledge, together with Master Gardener Steve Rawlins and a legion of others who volunteer for monthly Eco-Restoration Days. Taken altogether, the property is an idyllic setting, a veritable green island in the midst of an urban crossroads, and is often booked for weddings, showers, milestone birthdays, commercial photo shoots and memorials. After one such service in 2009 — an indoor eulogy followed by a Keystone patio reception and grounds bird walk — in memory of Elizabeth Smith’s mother, Betty Hanson Kuehner, Smith was so inspired by the setting that she volunteered with TAS. In 2010, she launched the Conservation Concert series to raise funds to rethatch the property’s Miccosukee-built 20×30-foot chickee; this winter marks the 10th anniversary season. Since 2009, the chickee has been rethatched twice with concert proceeds, and countless other improvements have been made to the property. “So much has been accomplished here simply because my mom loved birds,” Smith notes. “It’s the classic pebble-on-the-pond ripple effect. 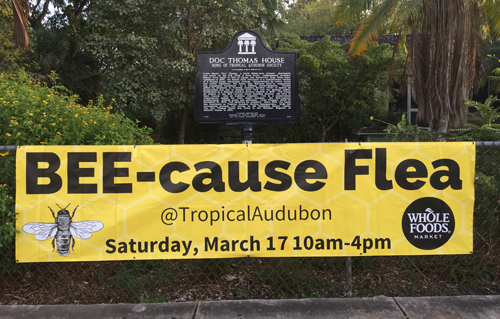 ” (To hold an event here, contact events@tropicalaudubon.org. 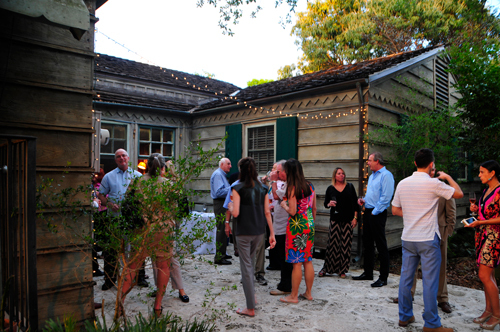 “Walk in the Woods with Wine & Whisk” patrons enjoy a Champagne reception on the Keystone patio. Winners of National Audubon’s Photography Awards perch every autumn in the Doc Thomas House for a month-long exhibit that is free to the public. 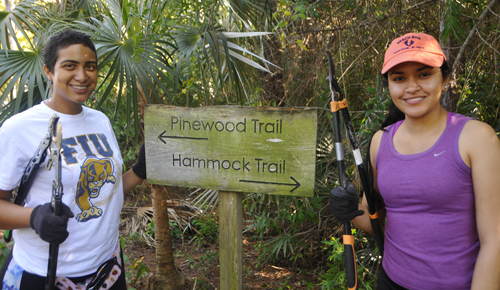 FIU Ecology Club members help steward the Steinberg Nature Center grounds at the January Eco-restoration Work Day. 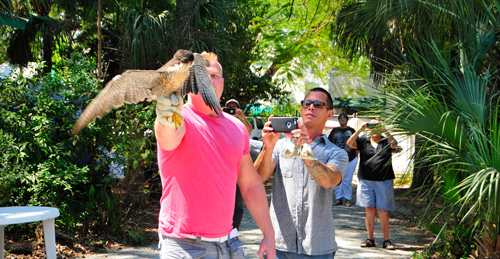 The release of rehabilitated birds of prey, such as this Peregrine Falcon pictured with wildlife enthusiast RJ Starr, is part of the annual February Bird Day event. 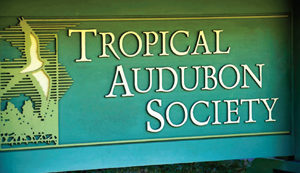 Established as a National Audubon Society chapter in 1947, TAS traces its origins to the Coconut Grove Audubon Society (CGAS), founded April 16, 1915 as Dade County’s first Audubon society. Area pioneer families were among the charter members, including the Munroes, Mathesons and Deerings. 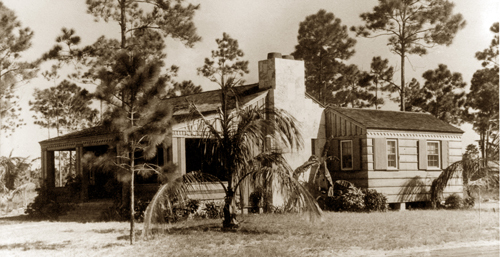 CGAS met in member homes and advocated for bird and general wildlife protection, encouraged placement of game wardens to protect plume birds, provided ornithological education to school children and the public, and also collaborated in the movement to establish Everglades National Park. Due to the rigors of World War II, however, CGAS went inactive in 1942. It was not until January 21, 1947, that former members and other interested parties would meet to form a new chapter shepherded by Charles Brookfield, then employed by National Audubon Society. They would settle on a more sweeping name, Tropical Audubon Society, which grew with Brookfield’s indispensable guidance from CGAS’s roots. The conservation ethos on which both societies were founded has never been more consequential than it is today. Tropical Audubon Society is positioned on the frontlines of environmental protection in South Florida. From opposing a proposed Jetport in the Big Cypress/Everglades in the last century, to standing firm now against contamination of our drinking water and rejecting the expansion of SR-836 beyond the Urban Development Boundary, to advocating for mitigation of Sea Level Rise, TAS’s nonpartisan activist role is increasingly crucial. To distill its scope of work, the health and protection of our water resources — both fresh and salt for wildlife and humans — is central to TAS’s modern mission.